If you are arriving at Passau on a Danube River cruise ships, the boat will dock at a small park near the old town, and passengers can walk into the city to enjoy the pedestrian-friendly shopping areas, historical sites, and picturesque architecture of the buildings. Passau is a perfect example of a great river cruise port of call. It has interesting history, good shopping, and many fascinating buildings. This Bavarian town of about 50,000 residents is also home to the University of Passau, giving the town a youthful ambiance. St. Stephen's Cathedral in located in the center of the old town. It has three huge towers topped with green onion domes, so it's easily recognizable all over the town. The interior of St. Stephen's Cathedral is done mostly in white, which is quite a contrast from the dark interiors of many other large cathedrals. A highlight of a Passau visit is an organ concert in St. Stephen's Cathedral. The organ in this baroque church is the world's largest cathedral organ, with over 17,000 pipes and 233 registers.The organ concert is usually held at noon, allowing cruise ship passengers a couple of hours to explore Passau on their own after the concert is over. 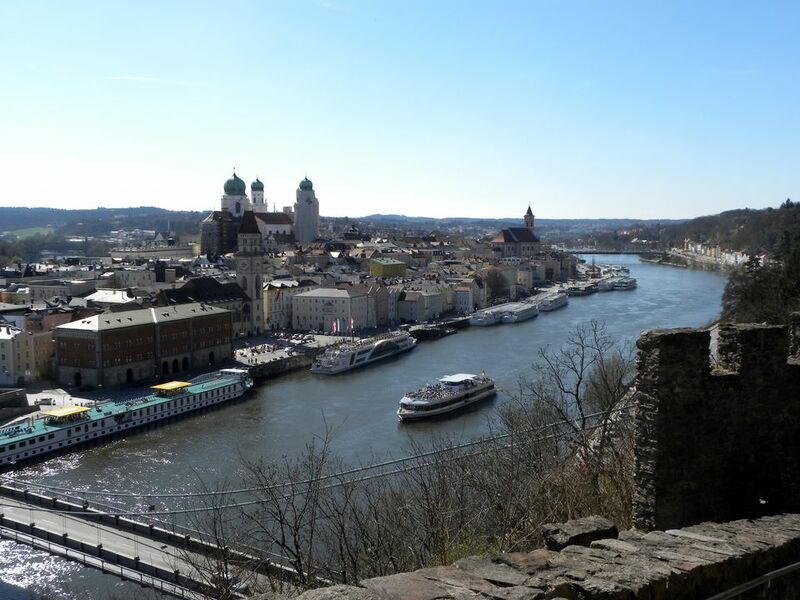 Passau is found near the border of Germany and Austria and sits at the junction of three rivers—the Danube, Inn, and Ils. In the 17th century, much of the old city was destroyed in a devastating fire, but the citizens rebuilt Passau in primarily an Italian baroque style. Across the Danube River from old town Passau is the Veste Oberhaus Fortress, which dates back to the 13th century. The powerful Bishops of Passau built and used the fortress from 1217 to 1803. Visitors can cross the bridge to visit this ancient fortress that overlooks the city and its rivers. A shuttle takes visitors to the top of the hill, but it's a good hike for those who enjoy the exercise. The view is worth the exertion. Enjoy a quiet stroll through the streets of Old Town Passau. The picturesque lanes will transport you back to an earlier time. This high water marker near the Danube River in Passau marks some of the worst floods over the centuries. The highest mark was 12.60 meters in the year 1501. Danube River cruise ships dock at this small but lovely park at the junction of the Danube and Inn Rivers in Passau. The "beautiful blue Danube" can sometimes become quite swollen and muddy during rainy seasons. This photo was taken in June 2009, but high waters can occur at any time of the year.